A novel is an impression, not an argument. 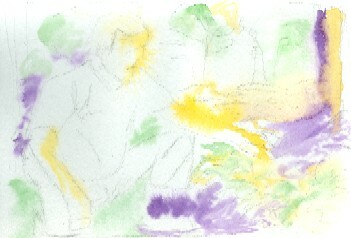 The Story of "Gardener Kneeling"
While I try to figure out how to finish my last painting, I'm off to the next one. I won't wait a month between them this time. 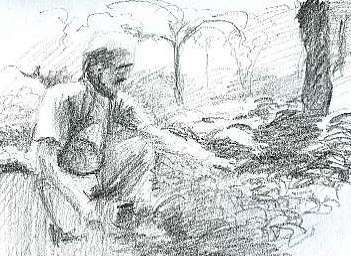 I own a book called The Victory Garden. 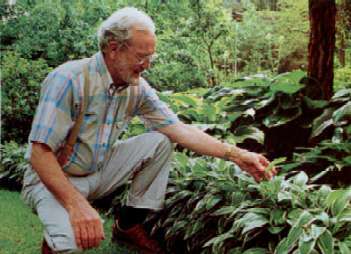 It was a PBS show, and there's a beautiful book based upon it of gardeners and their gardens. Fantastic stuff... and I need to get better at drawing people and their clothing. So I picked the first picture in the book and did a value sketch of it today. So I want to take a different approach with this - more abstract and colors of my own choosing, rather than try to paint strictly what's there in the picture, as I have done. 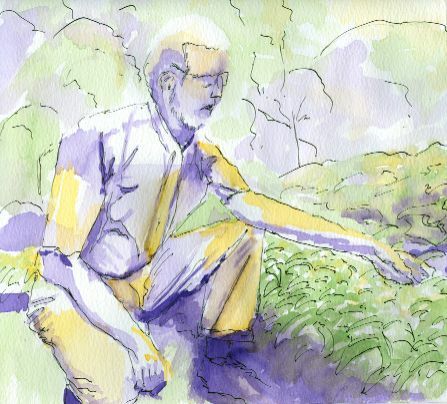 Read the whole story of "Gardener Kneeling"
My mom, god bless her, loves my artwork and bought me some watercolor paper for Christmas. She went to the local art store and, at the direction of the salesperson, spent a mint. One of the items she bought was watercolor canvas, a concept I'd never heard. It is essentially that: very thin canvas, supposedly designed to be used for watercolors. I've never tried it, and my initial thought was, "Gee, how does that stuff stand up to water??" But I figured I would give it a go in painting the guy and his plants. Some of you have written to me and mentioned in the comments that you might try your hand at painting. As you can see, "watercolor canvas" can't even stand up to the most simple of washes. Watercolor canvas is an oxymoron and a product disaster. Unless you're hoping that your paintings turn out in 3-D relief, skip the farce of this "paper." My recommendation: go for the 140 lb paper. I've been using Winsor & Newton paper, and it's fine. Use 300 lb for finished works that you want to hang somewhere. But steer clear of anything else. It wasn't all wasted effort though... I'm getting better at drawing this guy and I'm strengthening my sense of how I want to paint this. I don't know what I think of this yet, but what I wanted to do this morning was roughly skecth out in watercolor the colors I would use, and I wanted to apply some pen and ink, part of the stuff that I bought yesterday. 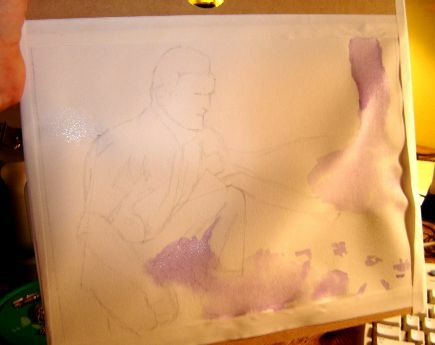 As I was working with it, I got a lot of satisfaction from laying down the violet wash. The green works for me as well. What I think I might change though is the gamboge (yellow-orange) hue. Maybe more of a light sienna (brown) would be better. The pen and ink was fun and definitely something with which I'll experiment more often. And boy howdy, it is a beautiful day today.